The sheer number of archaeological sites sets Malta's history apart from that of other Mediterranean destinations. There are megalithic monuments, Bronze Age dolmens, Punic tombs, remains of Roman villas and traces of prehistoric humans which defy explanation, such as the mysterious 'cart' tracks. For three millennia, from around 5200 B.C., the archipelago was home to a unique, temple-building civilisation. Malta and Gozo's temples are thought to be the oldest free-standing buildings known to humans. 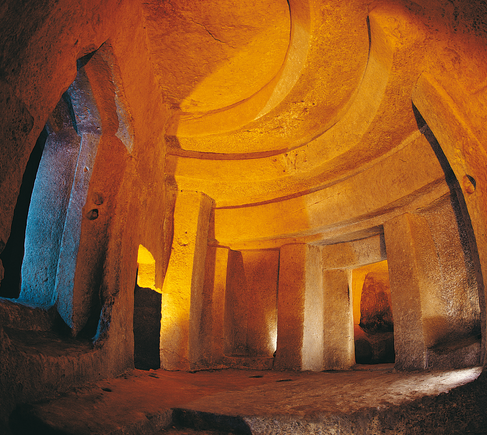 One site above all others is special to Malta - the Hypogeum, a labyrinth of underground chambers probably used as both burial site and temple. The islands' temples are UNESCO World Heritage Sites and are open to the public. One single verse in the Sacred Scripture has been always cherished as Malta's most treasured possession. The text, which has embedded itself firmly into Maltese life and culture, religion, history and tradition is a script from the final chapters of the book of the Acts of the Apostles. In this script we read how the Apostle Paul, who was being held prisoner and was on the way to Rome to be sentenced by the Romans, was shipwrecked off the coast of the island of Melita (Malta). It was during his stay on the island that St. Paul converted the Maltese to Christianity. Although the Maltese were dominated by various rulers, their strong faith in God has kept them together throughout the ages. Such devotion to their faith can be seen to manifest itself in the churches that the Maltese have cherished for a long time. Most of the shrines have been said to have miraculous images of statues, such as the crucifix at Ta` Giezu Church in Valletta, the Shrine of Our Lady in Mellieha and the Shrine of the Redeemer in Senglea.